The overall theme handling has been greatly improved in Windows 7 compared to the previous Microsoft operating systems. 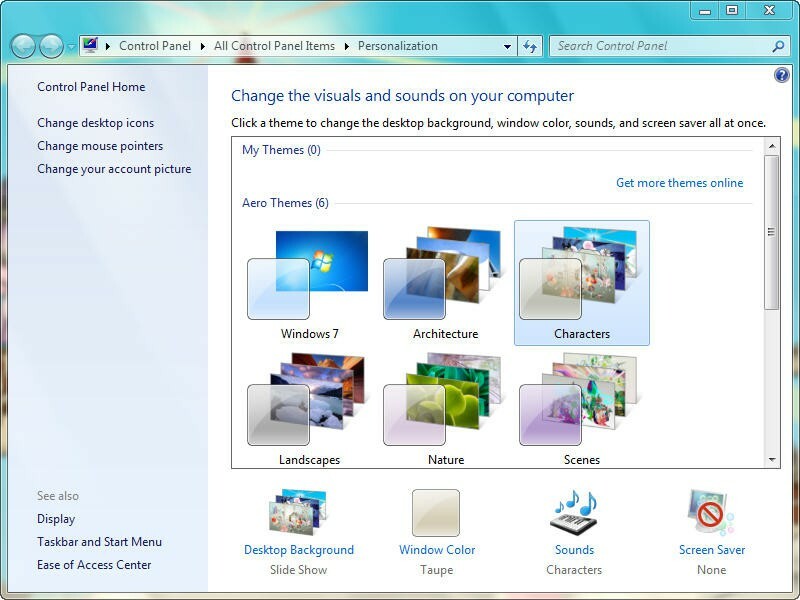 With this new features and changes in themes, Windows 7 now provides users more freedom in creating and distributing custom-made themes. A theme in Windows 7 is made up of various elements that includes a desktop background (wallpaper), sounds, window colors, screen savers, mouse pointers and desktop icons. All of these elements can be easily changed or customized. The easiest way to access both options is to right-click on the Windows 7 desktop. This will open a context menu where you will find the Personalize at the bottom. Clicking on the Personalize link will open the Personalization Window. In this window, in the left bar you will find links to Change desktop icons and Change mouse pointers settings. How to Block themes from changing mouse pointers? When you click on the Change mouse pointers link in the left sidebar of the Personalization window, it will open the Mouse Properties. The screen should look like the one below. 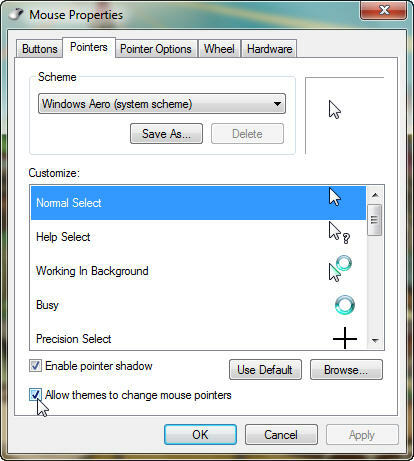 Now, Uncheck the option “Allow themes to change mouse pointers” to block Windows 7 themes from changing mouse pointers during theme installations. How to Block themes from changing desktop icons? When you click on the Change desktop icons link in the left sidebar of the Personalization window, it opens Desktop Icons Settings dialog box, similar to the one shown below. Here, Uncheck the “Allow themes to change desktop icons” option to block Windows 7 themes from changing desktop icons during theme installations.